Maximize your sightseeing opportunities in Rome before your cruise departs from Civitavecchia with our popular Pre-Cruise Rome Tour. Our Pre-Cruise Rome Tour and Transfer combination offers our guests the great option of spending the first half of their day enjoying Rome and then head straight to Civitavecchia to board your ship. You and your luggage will travel together and remain safely inside the vehicle under the care of your Driver while you sightsee so you have no worries but all fun! Pick up time: Your RomeCabs English speaking Driver will meet you at 9 AM at your accommodation in Rome. Transport to the Port of Civitavecchia: approximately 1.5 hours. 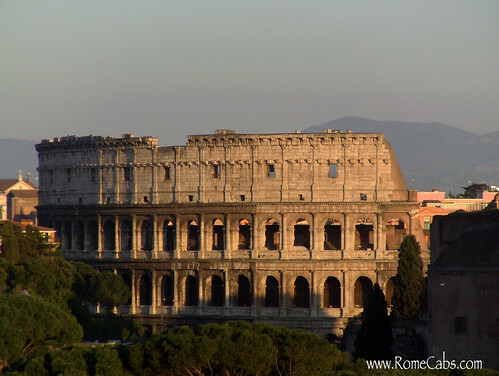 Your Pre-Cruise Rome Tour will begin with a visit to the famous Colosseum where you will have the opportunity to explore this once famous 1st century AD Ancient Roman amphitheater that at its peak entertained up to 50,000 spectators for 4 centuries with gladiatorial games, mock sea battles, beast hunts, public executions, and theatrical plays. What remains today is an iconic symbol of Ancient Rome’s engineering advancements that continues to inspire modern day sports stadiums. You will also visit 2 of Rome’s most fascinating squares that are among the most visited and recognized in films: Trevi Fountain and the Spanish Steps. The Trevi Fountain is the most famous fountain in Rome, with thousands of hopeful visitors tossing a coin to ensure a return to Rome. The fountain has been featured in popular classic films such as La Dolce Vita and 3 Coins in A Fountain and is one of the most recognizable sites in Rome. 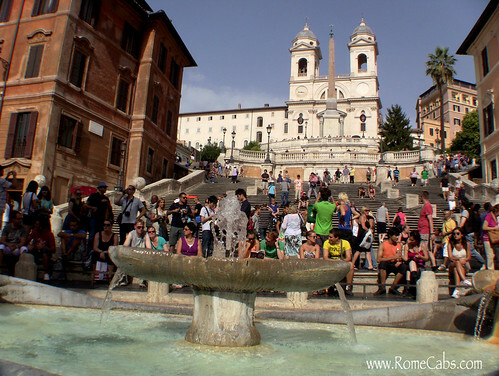 The Spanish Steps features the elegant 18th century winding broad stairway that connects the the square below to the French church of Trinita dei Monti above with the tall obelisk in front of it. Below in the square, you can admire the the lovely “Fontana della Barcaccio” or “The Fountain of the Old Boat”, created by Pietro Bernini, the father of Gian Lorenzo Bernini. During the hot summer months you will see a gathering of people around the fountain, many filling their water bottles with the fresh water that flows through it. 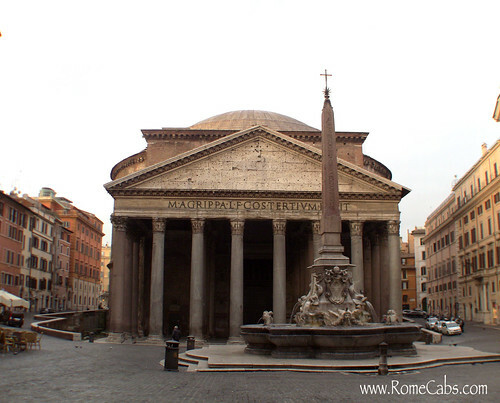 Not to be missed is the Pantheon, the best preserved of all ancient Roman buildings, and the oldest standing domed structure in Rome as well as in continuous use throughout its history. The ancient temple was in 6th century converted into a church and burial place for Italy’s most illustrious figures including King Umberto I and Queen Margherita, King Vittorio Emanuele II, and the famous Renaissance painter Raphael. When you look up to the center of the coffered dome, you’ll see the oculus (in Latin for ‘eye’) that has always been open to the elements of nature, allowing both sunshine and rain to enter. 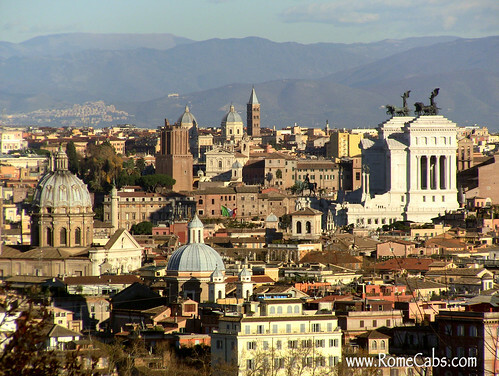 What better way to say “Arrivederci Roma” than to treat yourself to a splendid panorama of the Eternal City from the terrace square of Janiculum Hill. Beautifully sprawled before you lies centuries of history unfolding from church domes to rooftops to monuments ancient and new peering above the buildings around them. From here you will depart for Civitavecchia and sail on your cruise! * The price of the Pre-Cruise Rome Tour Rome and Transfer includes private deluxe vehicle with a professionally licensed English speaking Driver, Italy VAT tax, fuel, insurance, and parking fees. * The price of the Pre-Cruise Rome Tour Rome and Transfer includes does not include entrance fees, lunch, gratuities, or other client personal expenses. * The total price for the tour is per vehicle. Individuals may split the cost of the tour among themselves as they wish. * Please allow between 1-2 business days for email inquiry replies and service confirmations. * Payment for the tour will be made in Euro funds at the end of your journey. Your Tour Driver is NOT a licensed tour guide, therefore cannot accompany you away from the vehicle. * Italy has strict laws and regulations in place to protect licensed tour guides, this it makes it unlawful for Tour Drivers to act as tour guides and/or accompany guests away from the vehicle to sightsee. Your driver will be obliged to remain with the vehicle while you sightsee. * For your safety inside the moving vehicle, please do not distract the driver while s/he is driving, especially during traffic conditions. * If you are pleased with the service you receive from your driver 10-15% gratuity is customary in Italy. It has been reported that starting in May 2018, the Pantheon will begin charging Admission Tickets (currently estimated at 2 EUROS Per Person). Please be prepared for potential ticket lines or wait times to visit this monument. Price of Colosseo standard Admission Tickets booked online is 14 Euros per person. Please purchase your tickets to the Coliseum in advance at the link below. Select to print your vouchers at home and bring them with you in order to avoid long ticket line as the vouchers are required to be converted into tickets. If you are from the United States, please select "Stati Uniti" when prompted to select your country of origin. * If you are a party of more than 8 persons, please Click Here for information on booking multiple vehicles for 9 and more passengers. Don’t worry, we not ask for your credit card information to reserve any services, or penalize you for cancellations. We operate on the time trusted honor system, so we only ask that any cancellations be made at least 7 days in advance so we have the opportunity rebook your service and your reserved driver does not lose work for that day. Your cooperation is greatly appreciated. Cancellations must be made via email and confirmed by us in order for them to be on record. We do NOT accept cancellations by phone, text message, or 3rd party. IMPORTANT: ALWAYS CHECK YOUR SPAM FOLDER. If you submit a reservation or email and have not heard from us within 2 business days please check your spam folder, especially if using hotmail and msn accounts. If traveling during the summer months please be sure to wear sun protection, hat, sun glasses on your Colosseum visit. Security check points at the entrance of the Colosseum may cause additional wait time as lines may form to clear security. This unpredictable wait time may also impact ticket holders as all visitors are required to clear security prior to enterning. Any delays at the Colosseum are outside of our control. Please wear comfortable shoes when visiting the Colosseum, and on hot sunny days sun protection, sunglasses and hat are recommended. The area around the Spanish Steps and Trevi Fountain can be quite crowded, especially during the peak travel months, so be aware of your surroundings and keep your belongings close to you. Do not accept ‘gifts’ from street vendors approaching tourists around the fountain and square. WATCH: The newly restored TREVI FOUNTAIN!